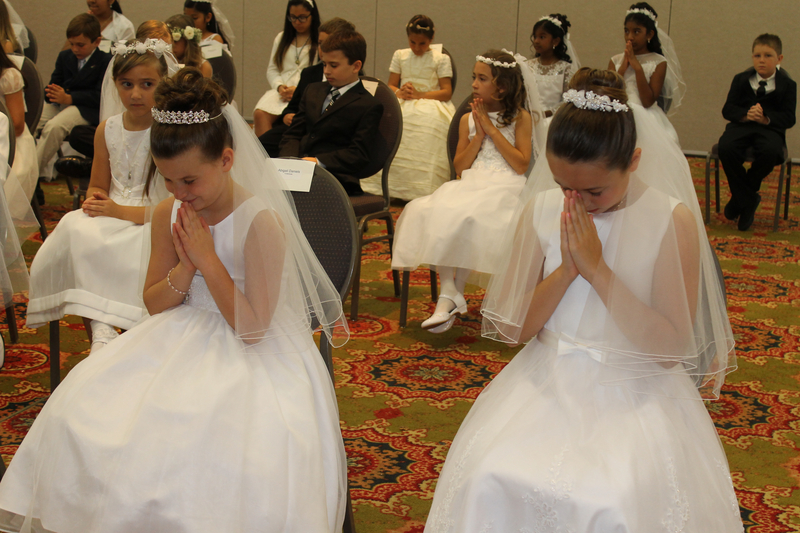 After several months of planning, preparation and lots of prayers, 75 children received the sacrament of First Holy Communion on Saturday, May 7. It was an absolutely beautiful day in Naples and the children were dressed up for the occasion. Fr. John reminded the children that the Eucharist they were about to receive was the spiritual food that would strengthen them along their journey of faith and that this truly was the Body of Christ. The moment they received Jesus for the first time was so special and the children were filled with joy! During the Mass, the Children’s Choir led by Ellie Roberts and Jeannine Fuentes made the day even more special. Lou Alteri, Food Service Manager, and the Men’s Club, provided a scrumptious celebration for the First Communicants and their families. We extend a very special thank you to the Catechists who worked so diligently to make this day as incredible as it was. Thank you to Valerie Barbosa, Sylvia DeFeo, Monica Gatt, Denise Helm, Gina Manfredi, Janeen Molan-Young and Pat Zewalk. They led by example as great teachers of the faith. To our priests — Fr. John, Fr. Jim, Fr. Bob and Fr. Rourke — who all shared special roles in preparing each one of the children, thank you! We are so grateful for your leadership and guidance in our lives. To the parents of the children, we are most grateful for the example you set, raising your kids in the faith and bringing them to church to learn more about Jesus. Please pray for these children as they continue on their journey of faith, that they may always know the love and compassion of Jesus and return for the spiritual food waiting for them and their families.